The Life of Bon: I'm not good with titles. But there is something you really need to read. I'm not good with titles. But there is something you really need to read. Were you wondering what my dog looks like? This is what he looks like. Usually I leave a little blurb of my own writing before I introduce a guest poster to you, but today I want you to spend all your time on Patricia's blog. She is truly a remarkable human being and reading her blog has given me such an appreciation for life. She stands out in the blogging community because her story is so unique. Make sure you check out her posts on foster care, as they are especially moving. She talks candidly about how she ended up in foster care, her best foster parents, her worst foster parents, etc. I have just spent over an hour scrolling through her blog, and am amazed at all that the human spirit can endure. Patricia is an absolute inspiration, and I hope you will feel the same sense of awe that I have when you read her writing. It doesn't hurt that she's an excellent writer and if you're still not interested in her blog, well, she lives in Sweden for crying out loud! But before you hop on over to her blog make sure you read this post on her "backwoods" Christmas traditions. I was hooked start to bottom. And now, Patricia. Greetings Life of Bon followers!! You're on a great page if I do say so myself. I blog over at Patricia Alexandra Creative about a bunch of things including life in Sweden (I emigrated EXACTLY one year ago!) depression, foster care, and how I see the world. Since it's the season to be jolly blahblahblah, I wanted to share some Christmas stories with you guys. 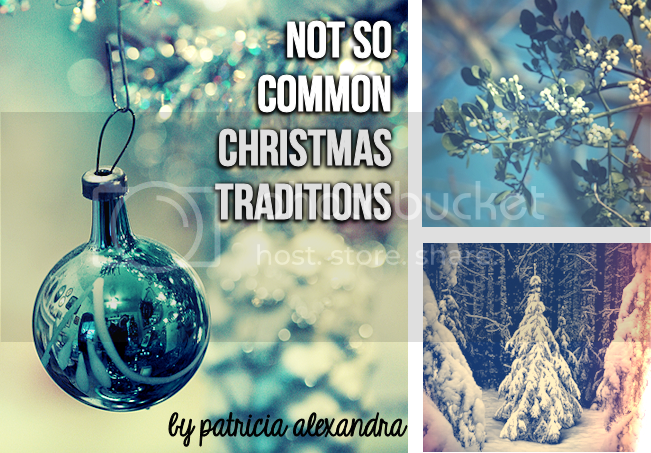 The things I'm about to share are not your normal Christmas traditions, assuming you live in the modern world. I was raised in a very poverty-stricken area of the south. For years there was no electricity or plumbing at all, though when I was a little older we acquired both. The house itself was a tiny three-room cabin right at the entrance to Appalachia. Winter for us was grueling; surviving on first hunted meat and in the later, more desperate months, potatoes potatoes potatoes. Ice storms and blizzards meant chances of no electricity for weeks, and we of course had farm animals to take care of during that time. And despite everyone being miserable and cold, our meager little holiday had some beautiful shining moments every year. My parents had (and still do have) an intense hatred of society in general and whenever possible, avoided it. Hence living in the forest. They hated the rush and flood of people in stores, and to a woodsman like my father, paying money for something that grew in the woods--a tree--was outlandish and uppity. On the first full moon in December, we used to gather in his hunting truck, with Dad driving, my mom and baby sister up front. If it was warm enough I got to ride in the back because I had, according to my Dad, 'sharp eyes.' We went on the full moon because we drove out into the wilderness with our headlights off. Dad was paranoid of attracting game wardens to our presence. So we drove on tiny gravel and dirt roads, scanning along the way for the perfect tree. Sometimes we found it in one go, other times we would pile out, go investigate the potential tree, and be disappointed by its size or bald spots. It was an art, to "hunt" for a tree. Every year as an adult, when I doll up my artificial tree I remember sitting on the back of the truck, wind in my hair, hoping that the full moonlight spilling into the forest would be enough help me do my job. It always was. After hearing that we had no toilet or shower, you probably aren't surprised to hear we didn't have any nice possessions or fancy furniture. Everything in our house was broken and old. But my mother guarded her Christmas decorations carefully; she had antique hand-blown glass ornaments, ornaments from Germany, beautiful porcelain Father Christmases, boxes of the most delicate Victorian lace decorations. Putting everything on the tree was not a mad scramble or a happy affair. It was more like a sacred ritual. My mother unwrapped everything carefully, she and my sister and I hung everything with precision and balance. My father sat and played his acoustic guitar and sometimes we sang along. When the lights went off and the tree turned on, it was the only time I felt like our home was a home. It was beautiful. Everything was soft and molded together and smelled like pine. There were moments in my childhood that made me eager to be an adult, to make my life better than the one I had as a child. I guess you could say, times that gave me hope. Seeing the tree with the lights off for the first time every year was always one of those moments. I admit, I've heard of people illegally cutting down their trees, and of poor people having expensive things they only break out on special occasions, but I have never heard of anyone who gathered mistletoe like my Dad and I. I was a Daddy's girl and always whispered to Mom when the time got right, that we needed mistletoe. She was great at nagging him about it, and always sent him out of the house at the first sniff of Christmas. I accompanied him almost every year that I remember. Mistletoe grows on trees; it's a parasite, actually. There were some very very old trees near our house that had it; the problem is, it grows far too high up to be able to harvest it. A cherry picker wouldn't help, a catapult wouldn't even help. These trees were ancient monsters. So my dad's solution? Shoot it down, of course. He kept a gun in every corner of our house; when he went to get mistletoe he grabbed up one of his rifles and walked the short path to the mistletoe-ridden trees. I shouldn't have to explain to anyone that to shoot a plant, on a tree, from a long distance, while aiming up, is difficult. I have a feeling my dad enjoyed the challenge though. He would always get down on one knee, demand silence, and aim up. I held my breath because I knew he held his. Sometimes he shot after five or ten seconds, and sometimes it took several long minutes. After he shot we would go search through the brown leaves for the bright green sprig of mistletoe. Not exactly typical, but I thought it was so fun anyway. And there you have it--a glimpse into Christmas for a very poor and backwoods girl. Now I live in Sweden, in a beautiful house with beautiful people and we are able to afford expensive things for each other. We have plenty of big stores nearby with nice decorations and of course, the trees you buy, and they as well as the mistletoe are plastic. I'm thankful for not having to starve all winter or tend to starving animals all winter, but there are still those beautiful memories that I have that I miss. I hope everyone has a glorious Christmas, or Jul (pronounced like Yule). Pop on over to my blog to learn about more Swedish stuff, and god jul och gott nytt år!!! Awww. I like him all fluffy like that. :) Reminds me of the toy poodle we had when I was a teenager. This is such a neat guest post. I can't wait to read more from you Patricia. This was such a beautiful post! I felt like I was reading a slightly more modern version of Little House on the Prairie - it gave my heart the warm fuzzies!